I am certainly not a superstitious person but when it comes to eating on New Year's day there is one thing I am not taking any chances on — prosperity in the new year! 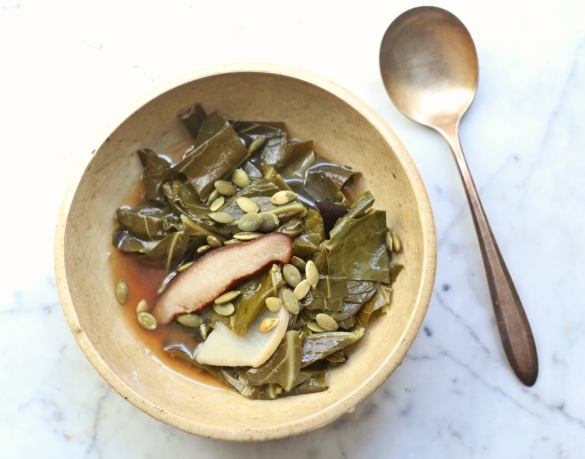 The old Southern tradition of eating greens (collards, dandelion or turnip) on this first day is said to bring wealth and prosperity in the coming year. 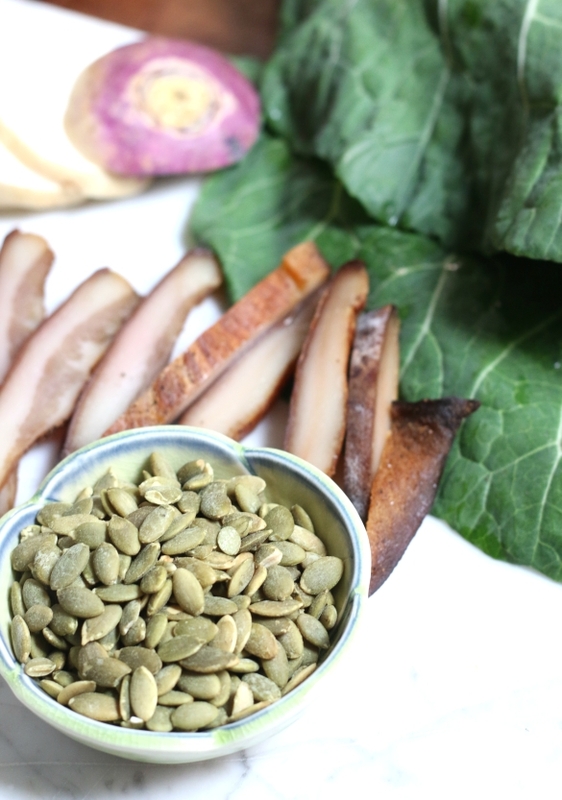 This year I decided to mix up my go-to greens recipe, adding a little flair by using barley miso paste and pepitas (or pumpkin seeds). What turned out was quite amazing, and resulted in a pot likker with a little different twist. 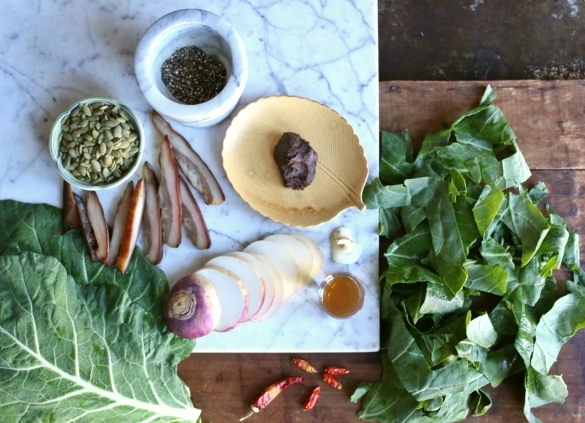 Prep Tip: Collards can easily be ripped by holding the stem at the thick end and then wrapping your hands around the leaves at the base and puling away from where you are holding the stem. This allows the leaves to tear along the stem leaving just the leafy greens. Of course, using a pairing knife to slice down each side also works. Start by adding the 6 cups of water to a large stock pot. Nestle the smoked meat and turnips inside with the vinegar, then add the fresh ground pepper. 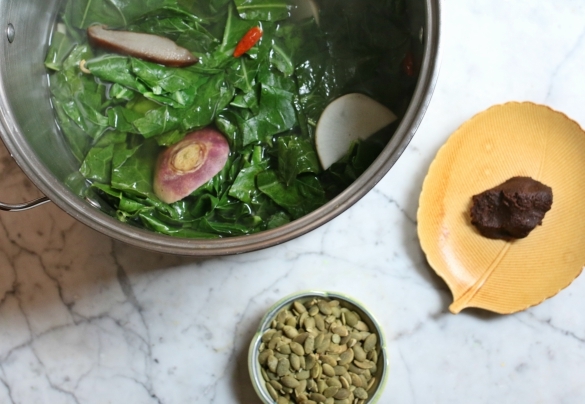 Bring everything to a boil and reduce heat to a low simmer. Allow the meat to cook for about 30 minutes, which will season the water. 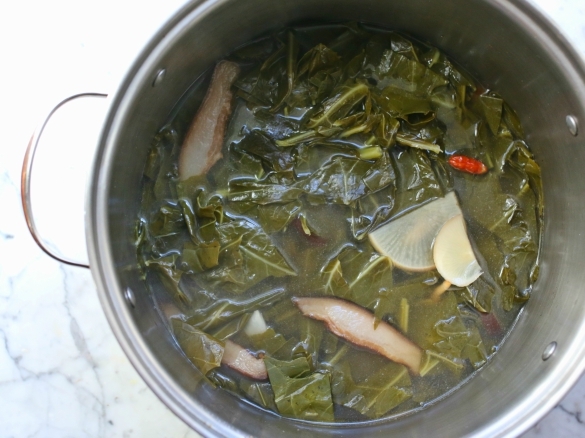 Once seasoned, add the ribbons of collard greens and continue cooking for for about 20 minutes over the low simmer. Once the greens have turned a darker hue they're getting close to being ready. Taste the leaves for tenderness and the broth, adjusting with more pepper as you like. Do not add salt at this time, which can be adjusted after we add the miso. 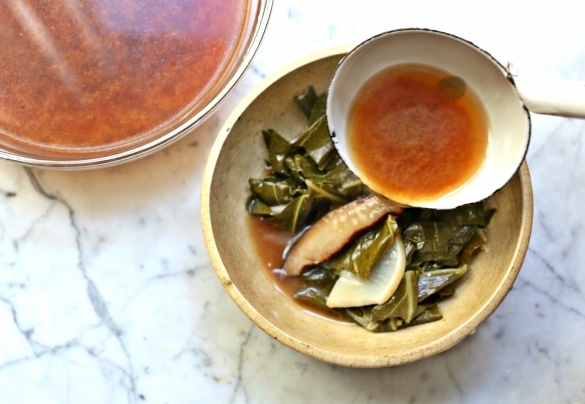 Add the miso to a small bowl and take a cup of liquid from the collard greens. 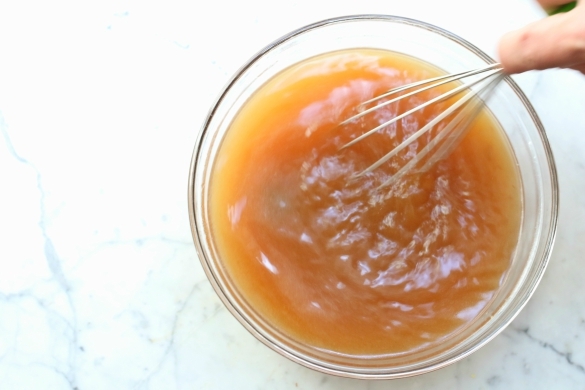 Slowly pour the liquid into the miso bowl and stir with a whisk until the miso is dissolved and incorporated. 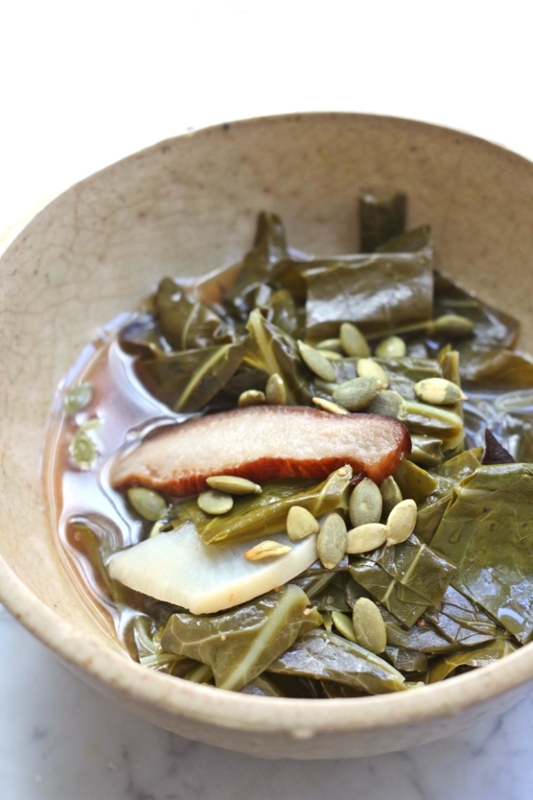 To serve, spoon a portion of collards into small bowl, ladling extra miso pot likker over the greens. Finish by garnishing with pepitas. Now, sit back and wait for all of that prosperity to hit in the new year! Wishing everyone a happy and prosperous 2016!